Catherine Murphy's hanging copper fairy will add a magical touch to your outdoor decor. Like your own backyard cast of A Midsummer Night's Dream, Catherine Murphy's hanging copper fairies will add a magical touch to your outdoor decor. Each stick figure-inspired sprite is crafted from patinated copper with endearing details and a clear coat finish for outdoor, year-round use. 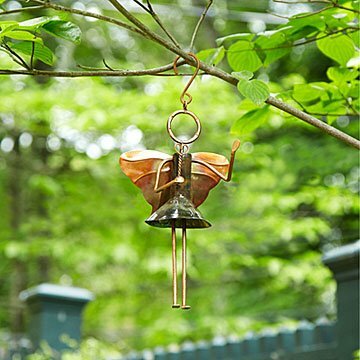 Hang them from a garden stake, tree branch, porch, or doorway for a note of lustrous charm. Handmade in Asheville, North Carolina. Perfect gift for a gardener. This product is so well made. So glad that I purchased it. Hang from hook, window, tree or flower pot. Perfect guardian in any location inside or outside. Adorable addition to the garden! She is cute! Have placed her right outside the door going to the patio so we can receive all her good wishes! This was a gift from my daughters for my mom. She loves her garden and being outside and she LOVED her gift. She said it was so unique and totally her. Favorite Mother's Day gift we've ever given her! Love the detail and choice of metal which reflects the light when hanging from a tree branch. It is delicate and whimsical; we both love it. I LOVE my new Garden Fairy!